It will take effect in four months. 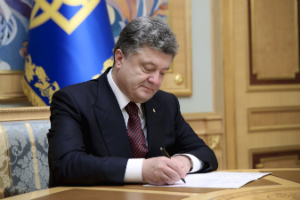 Ukrainian President Petro Poroshenko has signed law No. 1421-VIII amending some Ukrainian laws regarding the share of music products in the Ukrainian language in the programmes of television and radio organizations, Interfax-Ukraine has reported. The press service of the head of state reported on 6 July that the document aims at providing for at least 50 per cent of national audio and visual products in broadcasts of each television and radio organization. According to the law, television and radio organizations are to broadcast at least 35 per cent of all songs in 24 hours in the national language, and at least 35 per cent of songs broadcasted between 07:00 and 14:00 and between 15:00 and 22:00. The share of songs in the national language and foreign languages that are official languages of the European Union is determined in the licenses of television and radio organizations. The law will take effect in four months from the moment of its publication. The smallest share of programs in the official language is to be at least 50 per cent during the first year when the law is in effect, at least 55 per cent during the second year and at least 60 per cent during the third year.